After taking down the River Poker Series main event earlier this month for a whopping $651,559, Aaron Massey is oozing with confidence. And why wouldn’t he be? The Chicagoan has racked up more than $1 million in tournament winnings, and feels his best days are still to come. He currently sits in the top 100 in Card Player’s 2012 Player of the Year race. Card Player was able to pick Massey’s brain about his recent success, his earlier days in poker, a somewhat accidental exposure to pot-limit Omaha, as well as what “type” of person makes a successful poker pro. Logan Hronis: First, tell us a little bit about your poker beginnings. Where did you start to pick up the game of poker, and how has your career progressed to where you are now? Aaron Massey: I first learned poker from my grandma Celia. When I was a kid, we would play five-card draw, and she would always try to cheat (seriously). As a sophomore in college, I learned no limit from my roommate and started watching the World Series of Poker on TV — yes, when Moneymaker won it. Over the next few years, my interest in the game turned into a passion that I was very serious about. Around 2008 I met Kevin Saul. I didn’t really like him because of his ego. He didn’t really like me either, because of my ego (laughs). After a full year of knowing each other, we became friends. He saw something in me, and he decided to start taking my action in small live tournaments. Over the next year I won him a marginal amount of money. Then he fired me. But he turned around and got me a deal with someone else, to play full time both online and live, and to play bigger, which was what I had always wanted to do. I eagerly accepted this opportunity. Over the next year or so I played online full time and traveled to play WSOP Circuit stuff and a full summer WSOP and Venetian Deepstack Series schedule. The entire time I had Kevin in my ear and over my shoulder, like a shadow. He taught me everything about fundamentals and how to really play the game. When online poker went down, I jumped right back into playing live and traveling. I was back in my element, new and improved, with a whole new arsenal of ability, thanks to Kevin. With his guidance and my ambition, it was only a matter of time. And that time is now. LH: Early in your career, would you attribute your sustained success on a few big cashes, or a gradual bankroll building strategy? AM: As far as my early career, I can attribute my success to many things, but especially friends that helped me out with loot and support when I was a rookie in the game. Looking back, I’ve come to realize how many different things are important in order to have success. Building my bankroll by playing cash games is what covered my expenses on a daily and yearly basis. The small tournament cashes that I grinded out are very important to keep my overall tournament portfolio as profitable as possible. This way, when I do hit a big score, it isn’t just recovering past buy-ins that I’ve lost. The big score is what we are playing for in the first place, and it’s when we really get paid. Everything seems to be equally important. Also, each time I play (cash or tournament), I’m learning and getting better. Every small cash and failure along the way can be analyzed to see if mistakes were made. You correct flaws through repetition, and learn from experience. This is preparation for when the big score is there for the taking. So as you can see, everything is equally important because they are all necessary to fuel the end result, which is success. LH: You’re coming off a big win in the River Poker Series. Talk a little about what a win like that does for your confidence, and does it change your strategy in subsequent tournaments? AM: To be honest, I’ve never been short on confidence — perhaps even to a fault. I guess I am going to have a little more ‘swag’ now, but nothing’s going to really change. My strategy and tournament schedule moving forward won’t change either. I am just going to continue to play what I had on my schedule, and continue to improve and develop through repetition. LH: You also took down a pot-limit Omaha tournament in March of this year, in Chicago. Do you play a lot of PLO, and do you see more of it in your future? AM: (Laughs) I flew into town to play the Chicago Poker Classic $1,100 heads-up no limit, on February 29. Here’s the thing: I had booked my flight for the wrong day. It was a leap year and I was one day late for my tournament. There was, however, a PLO re-buy event going that day that I ended up taking a shot in. I asked Kevin what he thought and he gave me the green light. I had never played a PLO tournament in my life and had only played PLO cash like three times. So, yeah. I won the tournament, no chop, for like $40,000. I’m a good tournament player. I had one of the best poker players alive in my ear all the way down to the end, and it just worked out. I’ve played a lot more PLO since I won that tournament. LH: Talk about the difference in strategy between a PLO tournament and a no-limit hold’em tournament. In your experience, which one do you think requires more skill? 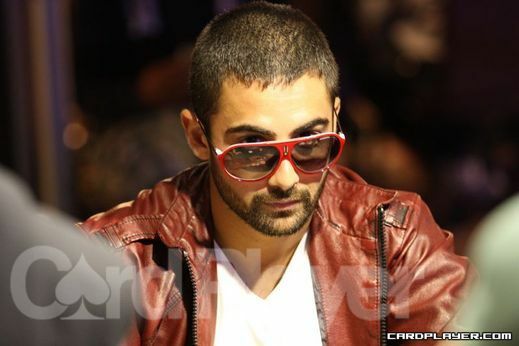 AM: The major difference I observed when I was in that in PLO tournament was that antes do not come into play. As a no-limit tournament player, I couldn’t believe it. I was able to be very patient and just wait to cooler people, knowing my edge in this game was lower, as I had never played. Generally speaking, both games are different and entail different strategies. I’m not qualified to say which one takes more skill, because I haven’t played enough PLO for my opinion to matter. LH: In a tournament setting, do you employ a more survival strategy, or will you take chances in order to command a large chip stack at the end (if you don’t mind divulging a piece your strategy)? AM: My tournament game has evolved over the years. At first it was reckless aggression, putting pressure on people based on nothing more than live reads. I was always a live player first. After meeting Kevin and playing online, my game became an incredibly patient “good” brand of poker. I had become fundamentally sound. After being a pro for a few years, and more specifically being exposed to John Dolan, my game has opened up and transcended into a balanced, experienced, fearless brand of poker that is going to be tough to beat for years to come. LH: Do you believe that it takes a certain type of person to be a professional poker player, or can anyone become one? AM: It definitely takes a certain type, but there are different kinds of certain types. There are many specific things in poker that you have to know or be able to handle. It takes a certain type of person to be able to handle the emotional swings. It takes another type of person to be able to understand human behavior, and another to be cold blooded. It takes another type of person to be able to analyze logic and numbers efficiently, and another type — well, you get it. I know one thing though. To be a professional poker player, you have to be the type of person who will never give up, the type of person that can keep fighting, and keep working, and keep improving though losing and the type of person who can get back up. That’s the type of person that will survive in this game. LH: If you woke up tomorrow and decided that you never wanted to play again, what would you be doing? AM: That would never happen. I would never decide to not play poker. I love poker. It’s what I do, and it’s what I want to do. Poker runs through my veins. I respect this game, and understand that it is a privilege to call this a career. Poker has given me the opportunity to make something out of myself, and I will never take that for granted. Poker has given me hope. It has given me inspiration. It has inspired to me win. So, I am a bit confused here - what exactly does he mean when he says "I had one of the best poker players alive in my ear all the way down to the end". Isn't it against the rules to be communicating electronically with a coach during a live tournament?? He means that Kevin Saul was there rooting him on and talking to him about strategy between hands and on breaks, nothing against the rules I would assume.